The 4th of July is right around the corner. 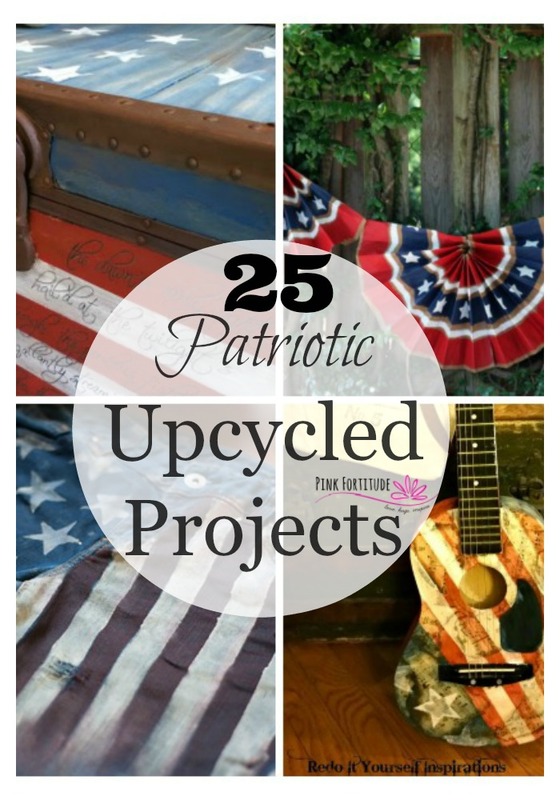 I’ve hand-picked 25 pretty freakin awesome patriotic upcycled projects from the most talented and creative bloggers on the net. Many of these projects even have a cool backstory. 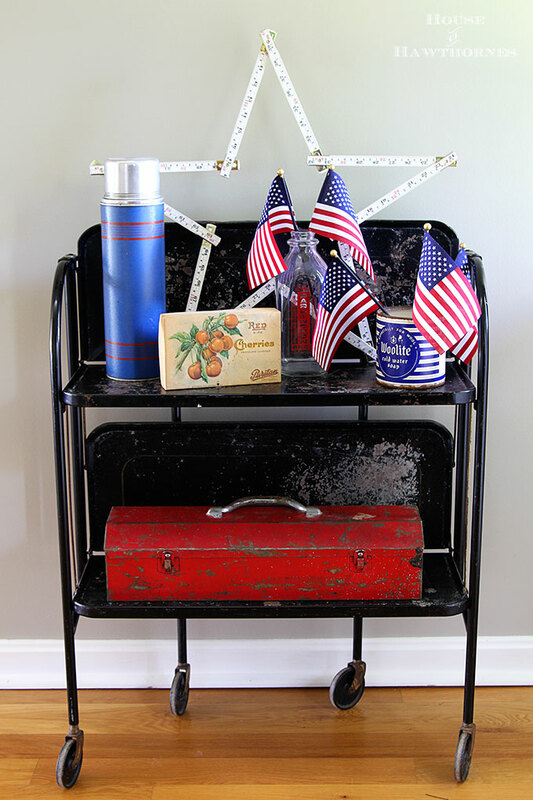 These items were headed to the landfill or in attics from childhood and are now the centerpiece of a celebration worthy of the red, white and blue. 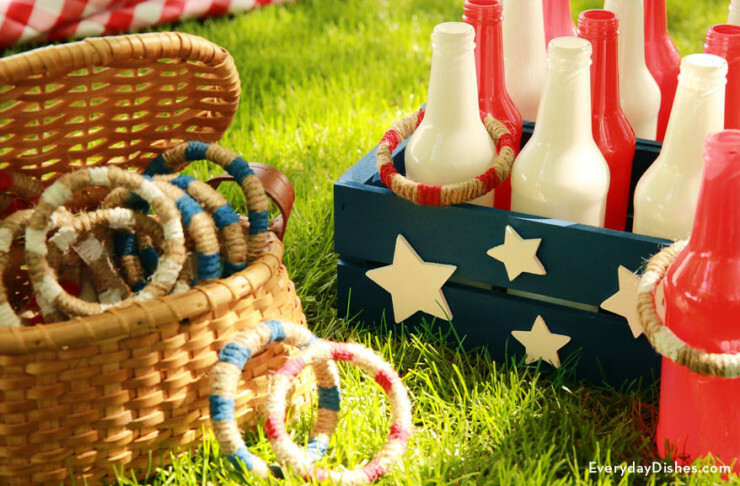 What do you have planned for the 4th of July holiday? I made a few rules for my picks. The item must be headed to a landfill, vintage, or made of natural elements. If it has a story behind it, all the better. That’s about it. You will be pleasantly surprised at these projects…. so let’s get started! This DIY Bottle Ring Toss Game by Everyday Dishes uses old CD crates and bottles. I know whose party I’m going to! 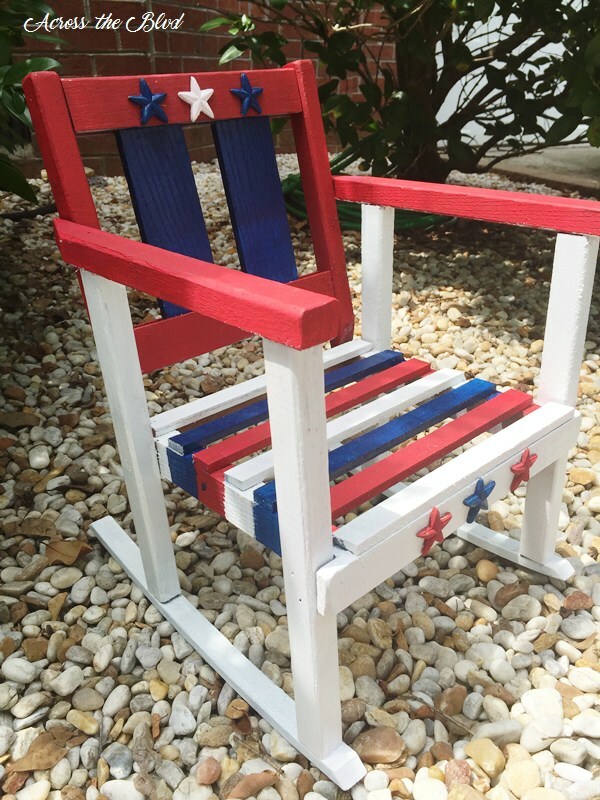 Across the Boulevard upcycles her child’s rocking chair into this darling Stars and Stripes Rocker. Pink Fortitude (that’s me!) 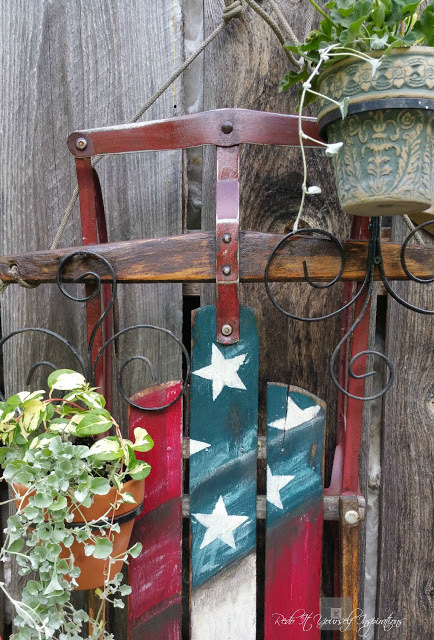 rescues an old pallet in her backyard and uses old paint to make this Flag Pallet for her garden. I think this is my favorite project. Ever. 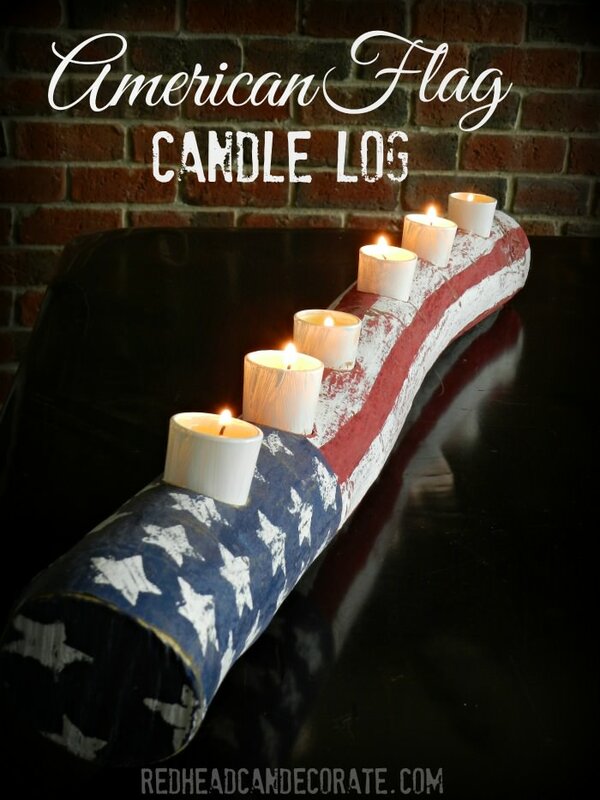 Red Head Can Decorate, aka my Sisa from another Mista makes this American Flag Log Candle from a log in her backyard. U Create Crafts paints a Flag on an Old Window. So simple, yet so stunning. 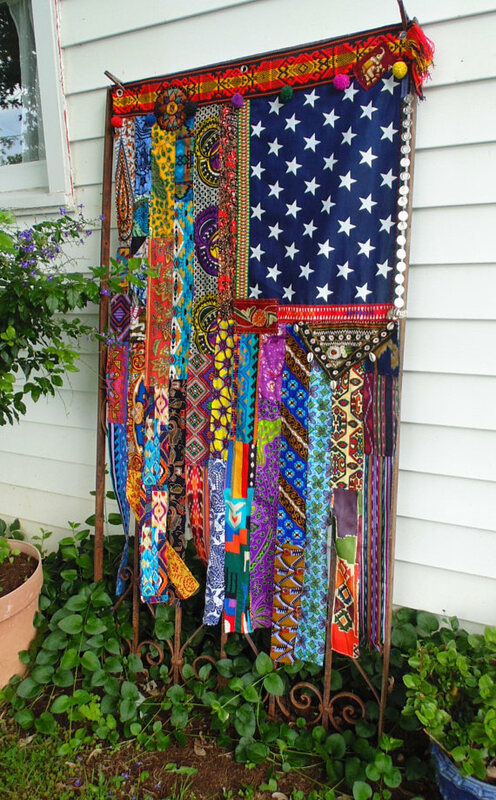 This Boho American Flag Tapestry by The Sleepy Armadillo is made with scraps and vintage pieces. O.M.G. This is gorgeous! Robb Restyle upcycles a thrift store table and some vintage pieces to create this adorable vignette. Red Head Can Decorate does it again. 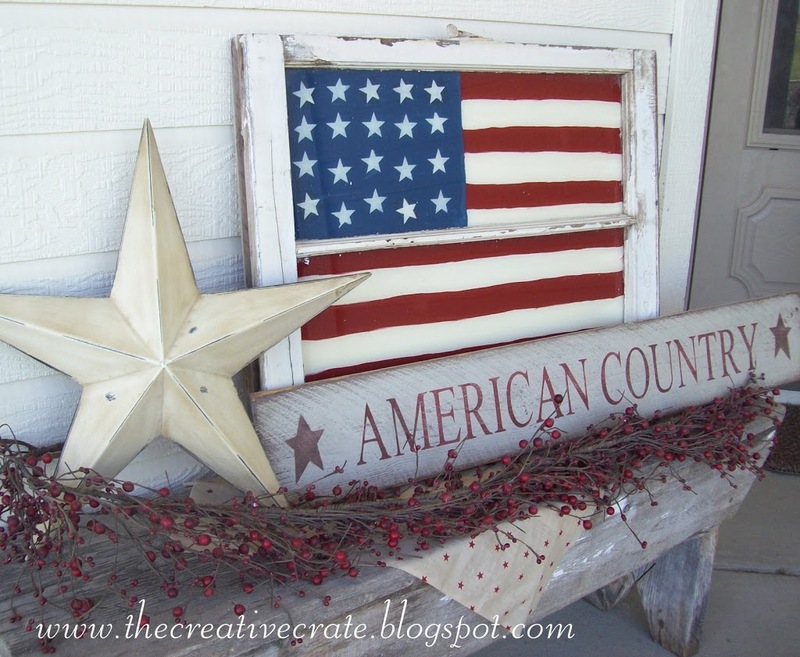 This time with an American Flag upcycle from her sister’s crib… circa 1957! Actually, all of the children in her family slept on it! Bel Monili is so talented – she takes vintage baubles and turns them into gorgeous jewelry. 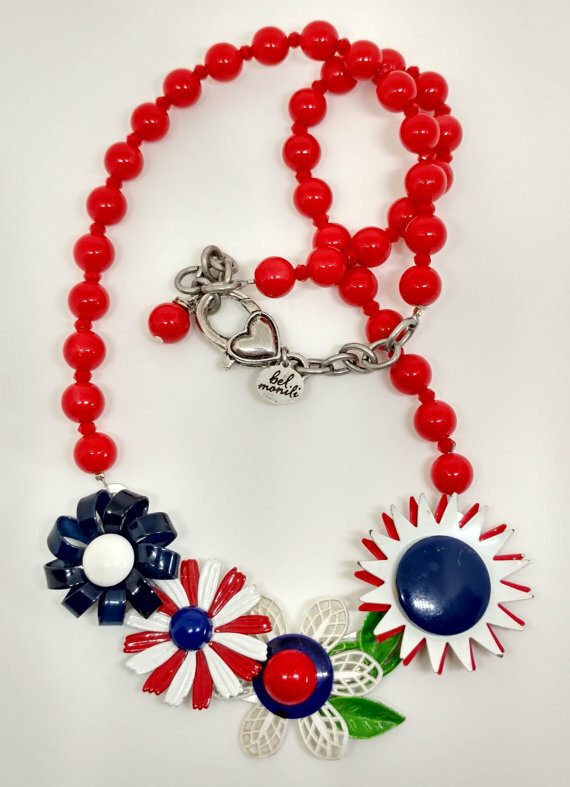 Check out this Patriotic Necklace. Pink Fortitude (me again!) took some corks and made this cute American flag using non-toxic paint. 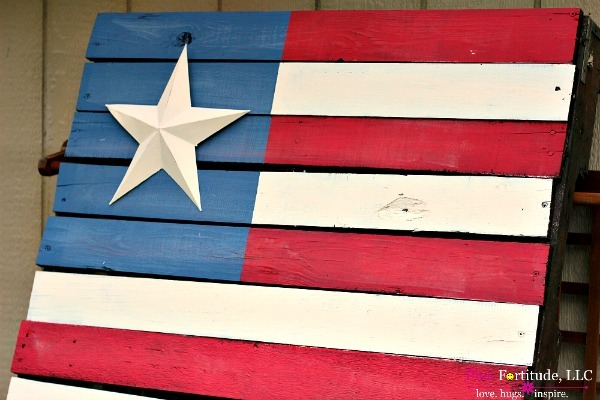 American Flag Wine Cork Upcycle Craft. I’m in love with each project Sadie Seasongoods makes. 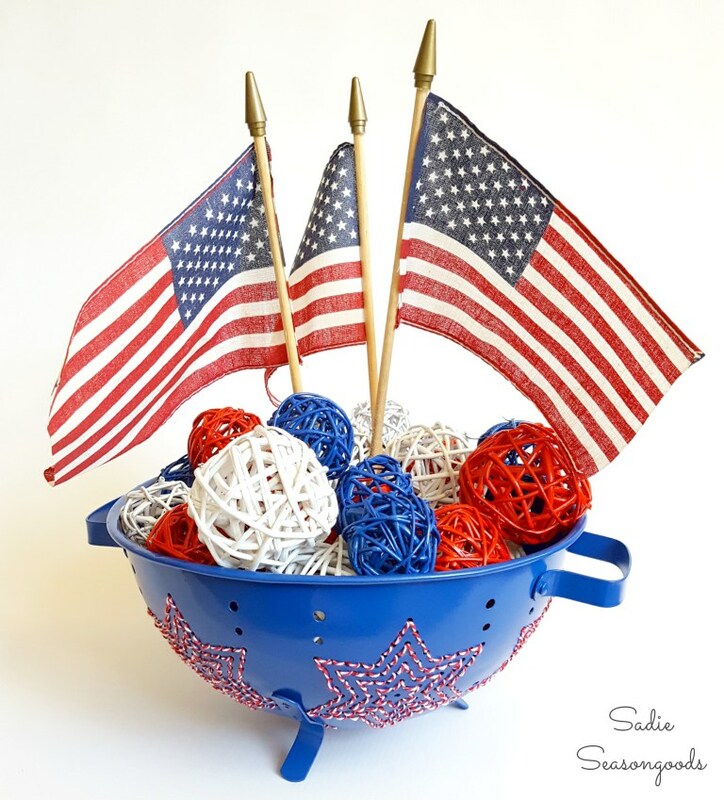 This is a Repurposed Star Colander 4th of July Centerpiece. 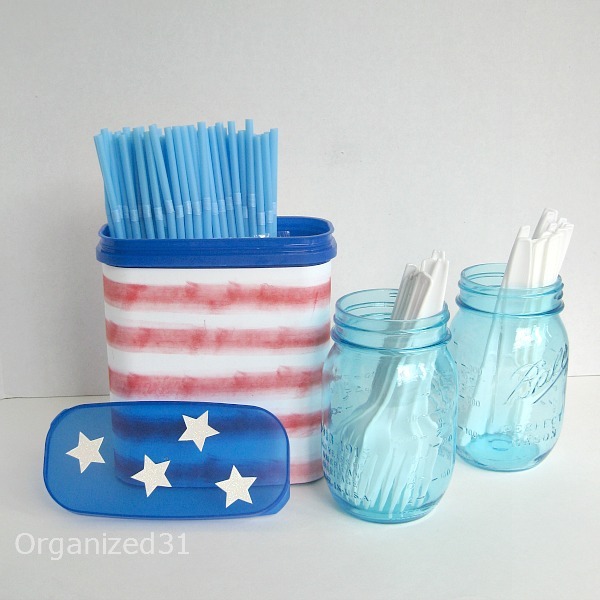 Organized 31 is one of my favorite upcyclers (and friends!). 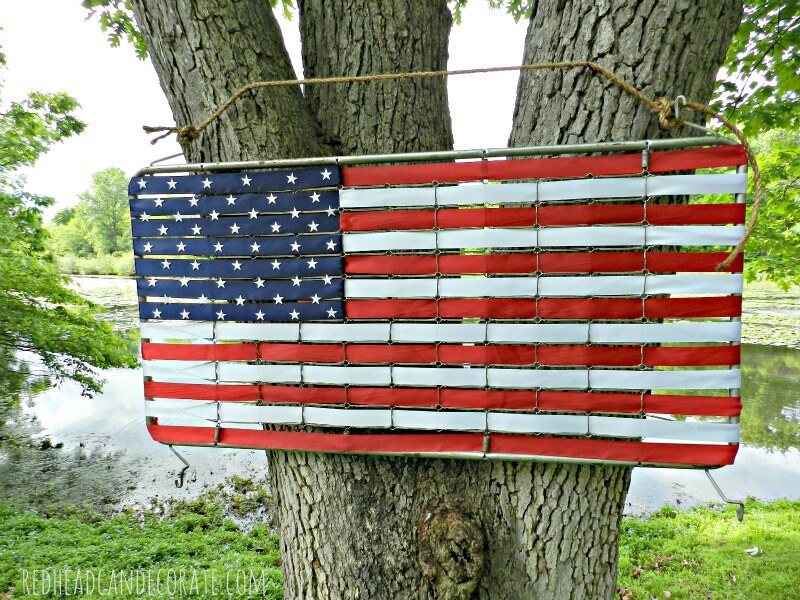 This All American Upcycled Can is so simple to make but such a wonderful way to upcycle a piece of trash! Shut the front door! 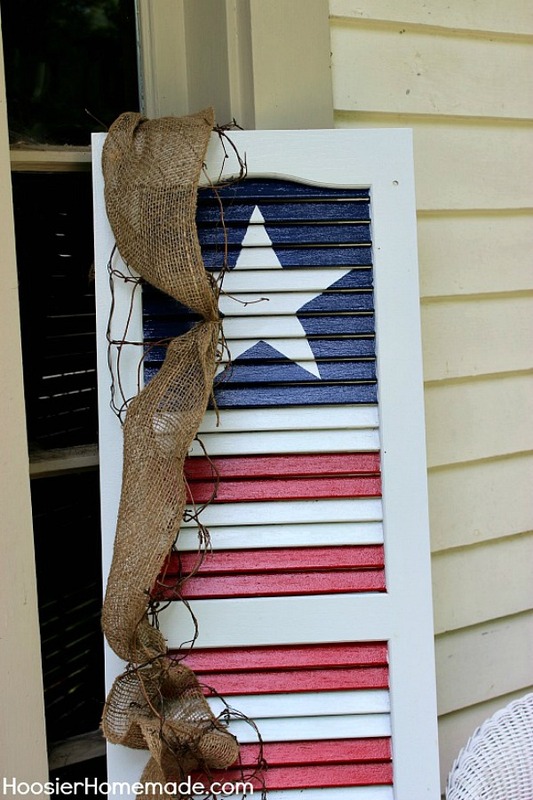 Hoosier Homemade turns this garage sale find into a Patriotic Shutter. I’m making me one of these for next year! Reclaimed barn wood anyone? 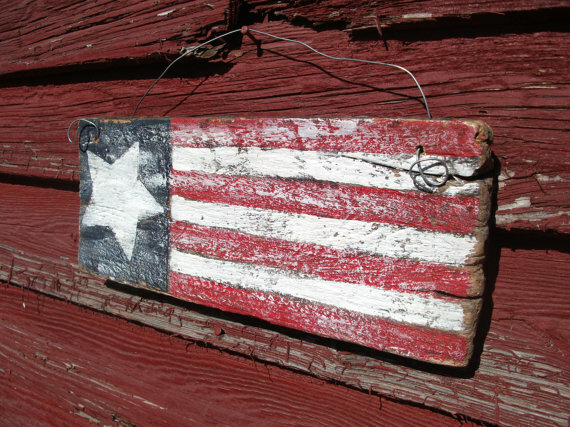 Reid Horse sells her Barn Wood American Flag on Etsy, but you can probably DIY this yourself. 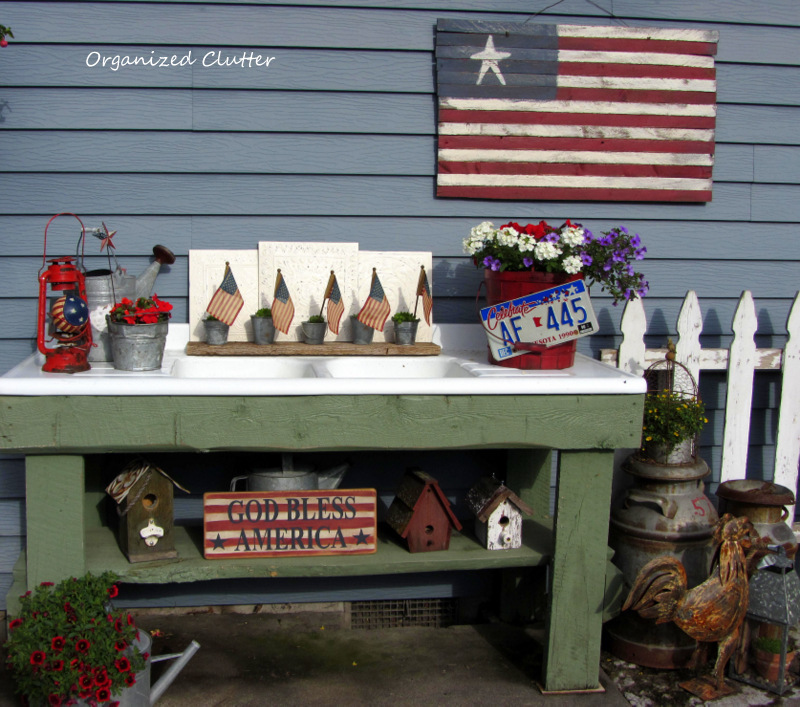 I love all of the vintage and vintage inspired pieces in Organized Clutter’s Rustic and Patriotic Potting Bench. Leave it to Sadie Seasongoods to take a broken piece of furniture (trash on the side of the road – literally!) and turn it into a Cross Stitch Flag. Oh say cane you see! This mom said no to the expensive shorts. So Overstuffed Life is teaching her daughters the importance of being frugal and sustainable with these Patriotic Cutoff Shorts. 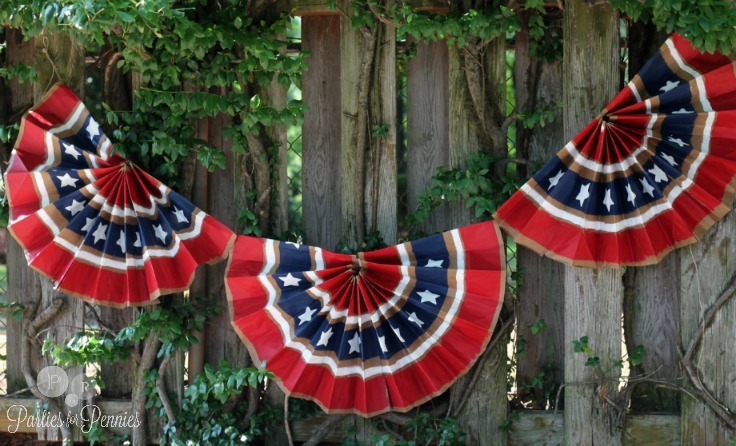 Would you believe me if I told you that these 4th of July Buntings were made out of paper grocery store bags? Creative Home has a great DIY from your leftover bags. 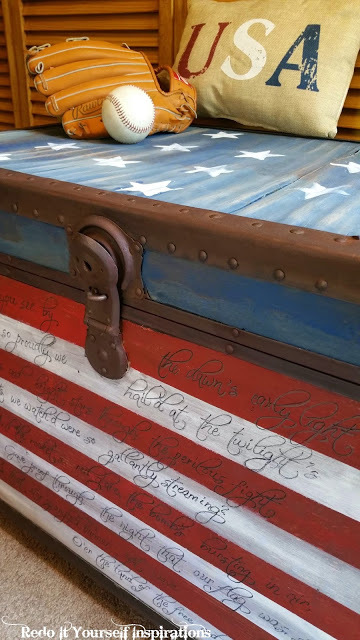 I remember the first time I saw this trash (literally) to Star Spangled Banner Trunk by Redo it Yourself – I was in awe! 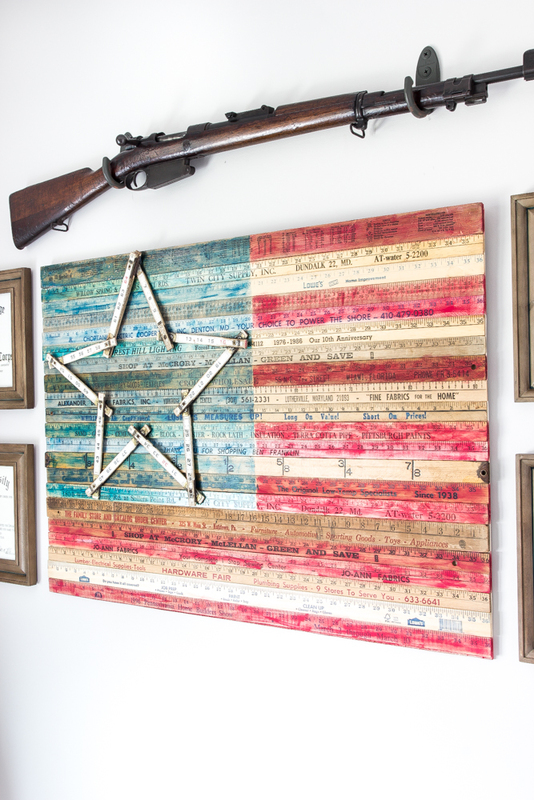 Blesser House made this super cool Yardstick American Flag Wall Art for her military husband’s office. They even have it displayed with a historic WWII rifle. You know you live a sustainable life when your friends consider you the dumping ground for trash. Artsy VaVa is that girl! 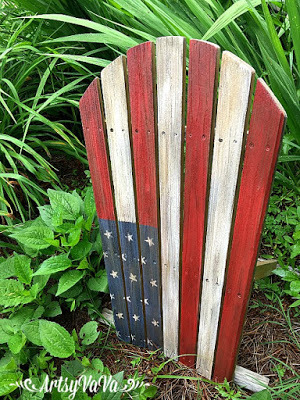 Her friend gave her a broken Adirondack chair so of course she turned it into this gorgeous American Flag Garden Art. Sledding in July? Yes, please! Especially when it’s this vintage sled that Redo It Yourself Inspirations turned into an Americana Planter. 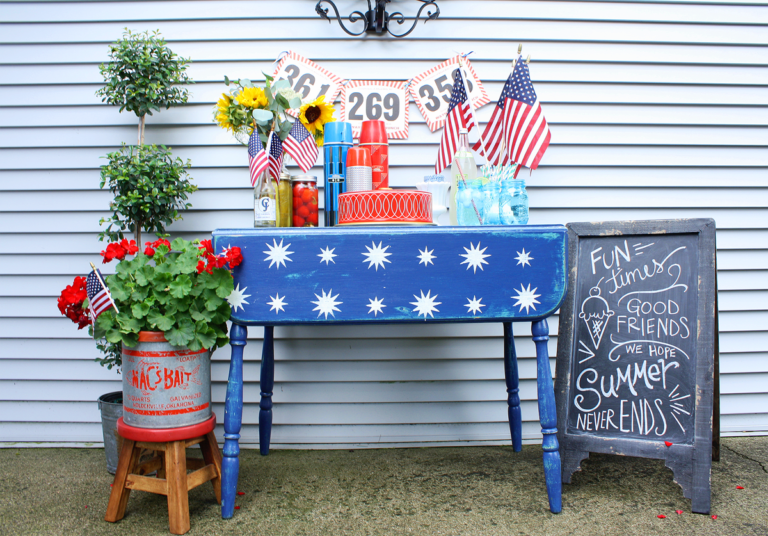 House of Hawthornes calls this the Lazy Girl’s Guide to 4th of July Decorations but I call it vintage perfection. 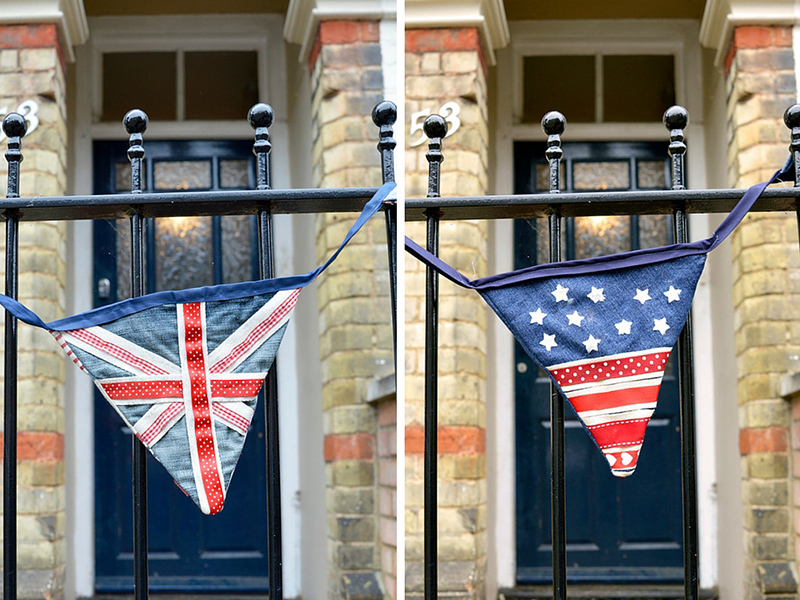 Whether you cheer for the Stars and Stripes or the Union Jack, I’m certainly cheering for upcycling denim jeans into this Flag Bunting by Pillar Box Blue. 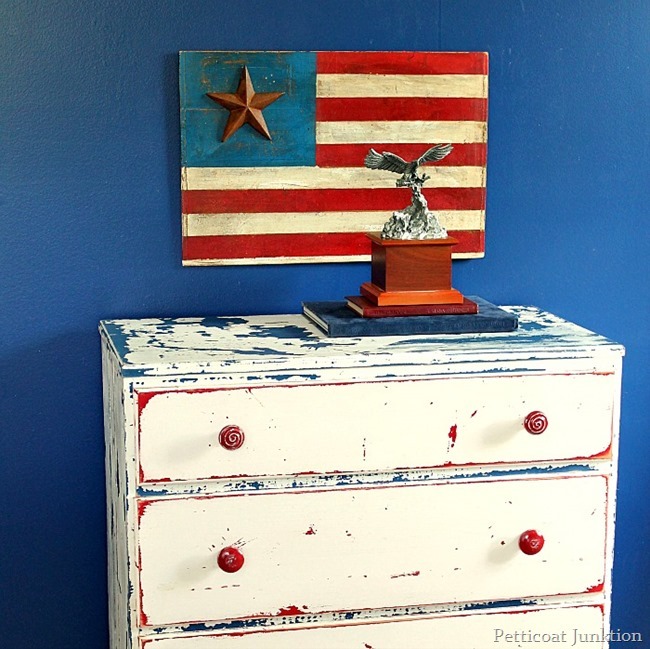 Petticoat Junktion made this stunning Iron Star Rustic American Flag from a drawer bottom and paired it with an upcycled red, white, and blue dresser in her Grandson’s room. Double the patriotism! 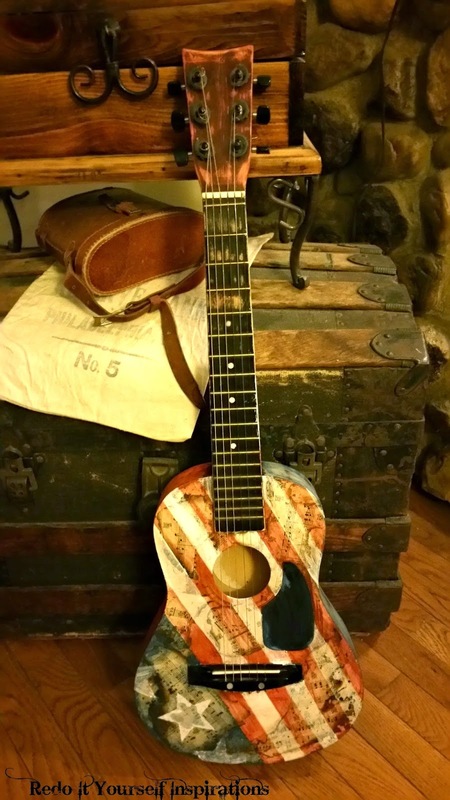 And the #1 fan favorite… drum roll please…..
Redo It Yourself Inspirations took her child’s beat up guitar and turned it into a rocking American Style Guitar. 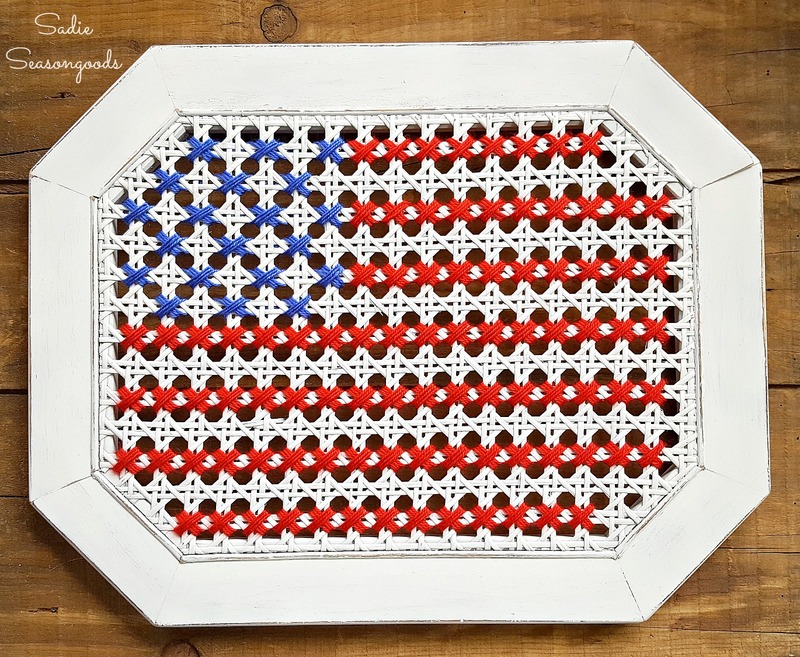 Love, hugs, and life, liberty, and the pursuit of a great upcycle. 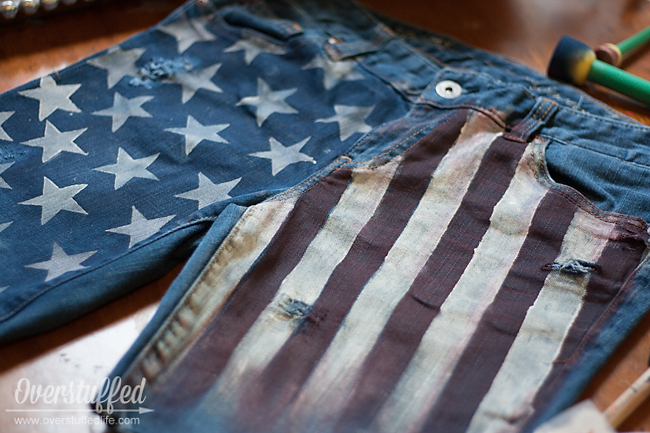 You know how much I adore patriotic projects and upcycled projects. You’ve married two of my favorites into one glorious post! 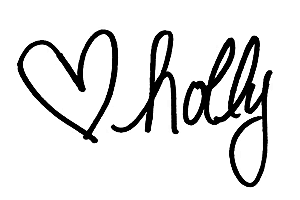 You are too sweet (and one of my favorite bloggers and friends, as well), Holly! Thanks for including my All-American Upcycled can. Happy 4th of July and thank you to the mister and your family for your service. These are just fabulous! I can’t wait to try some of them!